Back before the Big Beta there was nothing. Then the world began when the Godville beta was released in English and at every mile, or thereabout, a stone fell from the sky marked with a number, starting at 0 and presumably going on infinitely. Milestone 554 was one of those stones. That was the most interesting thing ever to happen to this stone, aside from a hero once graphitying their name on it a few years later. 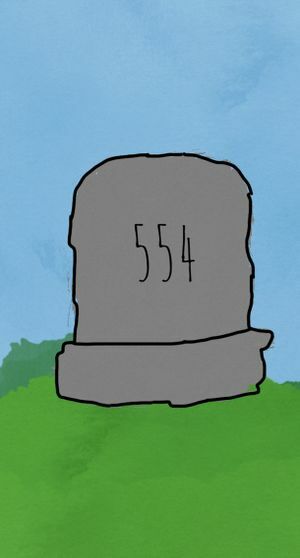 Milestone 554 is a random milestone. No one knows why this page was made, but no one questions it. It... It was just made. Should one gather the courage to question it's creation, the likelyhood of that someone soon ceasing to exist becomes astronomical. So, just don't. It's best to listen to the warnings, if you value your existence, that is. This page was last edited on 8 July 2018, at 02:13.